Hachiman Hikigaya has spent his time in high school as a loner. Through his observations of the "normies", he has arrived at the conclusion that their happiness is built on lies and that youth is a sham. Unfortunately, his teacher Ms. Hiratsuka doesn't take too kindly to this when he submits his idea in an essay, and punishes him by forcing him to join the Service Club. The Service Club's mission is to help students who ask for help with their problems. Not only is this the exact opposite of what Hachiman wants to do, but the worst part is that the only other member of the club is the intelligent, beautiful, and brutally honest Yukino Yukinoshita, who immediately takes issue with Hachiman's temperament. 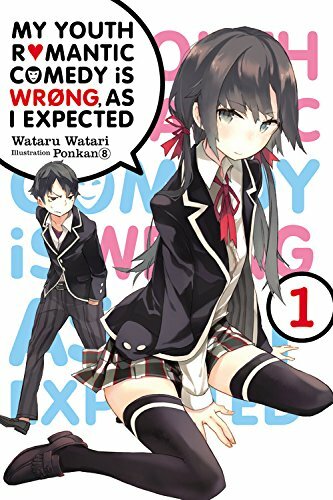 My Youth Romantic Comedy Is Wrong As I Expected's first volume at face value revels in the way the classic high school life looks to a loner student on the outside through the perspective of Hachiman. However, as much as Hachiman internally dismantles what he perceives as fraudulent, author Wataru Watari also makes it clear that Hachiman's own perspective is equally flawed. It's this kind of relationship between different individuals' perceived realities that is so frequently highlighted by My Youth Romantic Comedy, and it's quite good at what it does. The story of My Youth Romantic Comedy is told through the first-person perspective of Hachiman, and the narration often features his internal diatribes on other characters and their beliefs, or rather their beliefs as perceived by Hachiman. While Hachiman as a character is not aware of everything from the get-go, what makes this more interesting is his flavor of unreliable narration. Since Hachiman has a very strong agenda towards concepts such as youth and social interaction, his description of others' motivations and reactions are made clear by the story that they cannot be trusted. Hachiman's particular brand of unreliable narrating is especially enjoyable because it is generally accurate on the surface but flawed upon further inspection. Outside of his direct role in shaping the narrative of the story, Hachiman's general character is very intriguing as well. He's a fairly cynical person, which has earned him a certain fandom as an internet meme. His snarky remarks and frequent cynical examinations of his peers are both amusing and relatable. However, what really makes him work as a lead character and narrator is the depth to his character. Quite a bit of Hachiman's cynical worldview is a result of various events throughout his childhood that have often left him exiled from general society. As such, many of his "philosophies" are poorly disguised coping mechanisms. To have a character as well defined as Hachiman within such a short span of time is a fairly decent accomplishment. Considering how much of My Youth Romantic Comedy's storytelling relies on him as a character, it definitely benefits the series when Hachiman is well-defined and interesting. Of course, as much as Hachiman is crucial to the story, his romantic comedy includes others as well. Fortunately, Hachiman's depth of a character is mirrored in the development of much of the rest of the cast. Although we aren't able to directly read the thoughts of the others, author Wataru Watari is quite good at providing complex characterizations through Hachiman's interactions with them. The most pertinent example of this is Hachiman's fellow service club member, Yukino Yukinoshita. 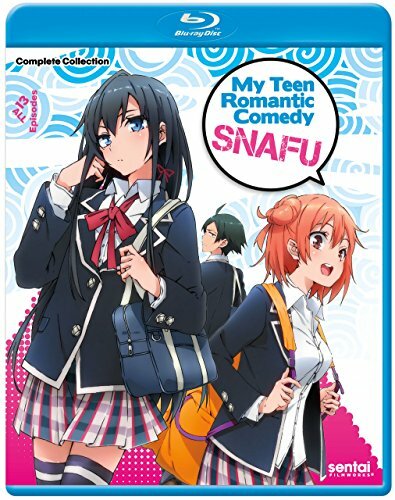 Yukino's self-explained backstory of being bullied out of jealousy for her good looks, along with Hachiman's own attempts at understanding her, provides a level of nuance to her interactions with the other high schoolers that is surprisingly complex for such a short time. However, although a lot of time is spent on Yukino, this synergy of characters' self-explained problems mixed with Hachiman's examination of them is a strategy Watari employs to great effect frequently. In doing so, he creates a very interesting cast in a very short amount of time. Because of this well-defined group of characters, My Youth Romantic Comedy is able to make its story setups go beyond the style of initial setups that many light novel series dedicate the first volume towards. The first volume is comprised of eight chapters, several of which catalog a new person and their problem. Through each of these, the main cast continues an amusing back and forth while their relationships with each other progress. I found this structure particularly effective because it created an episodic feeling of progression while advancing the overall dynamic within the cast. My Youth Romantic Comedy isn't the kind of story where Hachiman faces a sudden moment of complete change that puts him down the "right path". Hachiman, along with everyone else in the story, has a much more obscure direction to go in. At the same time, there is a satisfying feeling of progress by the end of the volume that makes the book feel fairly dense. My Youth Romantic Comedy enjoys a certain amount of lampshading of romantic comedy tropes, as the full title might suggest. Interestingly, I feel that it is slightly less successful at this so far than it is at its character development (although to be fair the bar was set pretty high). As much as Hachiman jokes about how his life seems to always put him in a romantic comedy situation that fails to pan out as he would expect, there is an underlying embracing of many romantic comedy tropes in the story that has mixed success. Many of the comedic and dramatic elements work for the most part, but sometimes My Youth Romantic Comedy inexplicably becomes exactly what it mocks. This is particularly evident in the fanservice-y scenes and illustrations that occasionally make appearances periodically in this volume. This issue is for the most part intermittent at worst. That being said, for such a clever series it is a bit disappointing when it does happen. My Youth Romantic Comedy Is Wrong, As I Expected is an amusing and well-defined take on Japanese romantic comedies. Through the biased and cynical viewpoint of Hachiman, My Youth Romantic Comedy tells a surprisingly thoughtful and complex story about the high school experience. Outside of minor annoyances, I found myself laughing and enjoying the back and forth between characters quite a bit. If you're a fan of romantic comedies or even just looking for an interesting light novel series, this one is an easy recommend. 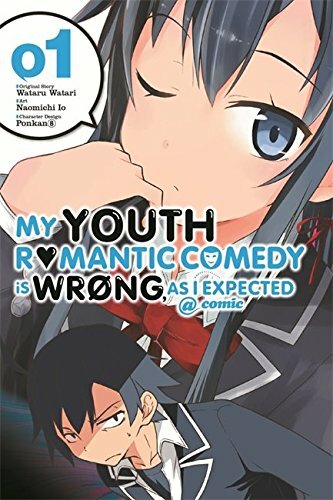 My Youth Romantic Comedy Is Wrong, As I Expected is written by Wataru Watari and published by Shogakukan in their Gagaga Bunko imprint. The series is translated by Jennifer Ward and published by Yen Press in English. The series received two anime adaptations by Enterbrain and Studio Feel in 2013 and 2015, respectively.